Your sinuses are hollow channels behind the cheek and above the upper teeth. Some of the roots of the teeth extend up into these spaces. When those teeth are removed, sometimes there is only a thin wall of bone left separating the sinus and the mouth. This bone may not be a substantial enough base in which to place a dental implant. 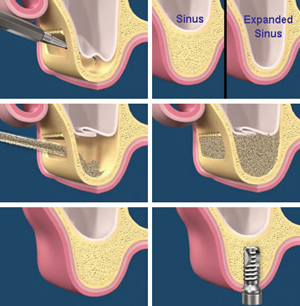 Sinus lift surgery is a bone grafting procedure performed to prepare a site for a dental implant in the upper jaw. Sinus lifts have shown to dramatically increase the chance of implant success. Patients have several anesthetic options when undergoing this procedure, including local anesthesia, general anesthesia, intravenous sedation or nitrous oxide sedation (laughing gas). After anesthesia, the surgeon makes an incision into the gum where the implant is planned. When the jawbone has been exposed, it is then cut to make a moveable flap which is pressed gently upward into the sinus cavity. This “lift” provides an empty space that can be filled with bone graft material. Sometimes the dental implant is placed immediately, but most often it is preferred to allow 6 or more months for the area to heal before placing the implant.